(a) Apply 26.7 kPa (200 mmHg, 7.9 in.Hg) of vacuum to the actuator. 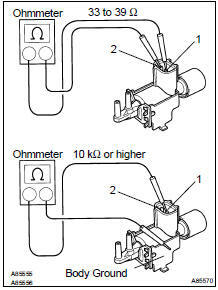 Check if the actuator rod pulls the lever and causes the valve to rotate open, as shown in the illustration. (b) One minute after applying the vacuum, check that the actuator rod does not return. If the result is not as specified, replace the IAC valve assy No. (a) Cover port C with your finger and blow air into port B. Check that air flows out of port A. (b) Cover port C with your finger and blow air into port A. Check that air does not flow out of port B. (c) Cover ports A and C with your fingers, and apply 60 kPa (450 mmHg, 18 in.Hg) of vacuum to port B. Check that there is no change in the vacuum after one minute. If the result is not as specified, replace the air cleaner cap. Check that air flows from port E to the filter. Apply battery voltage across the terminals. Check that air flows from port E to port F.